Every Sunday for the last month I’ve added 100 new search results to Lean Domain Search, a new domain search tool that I’ve been working on. 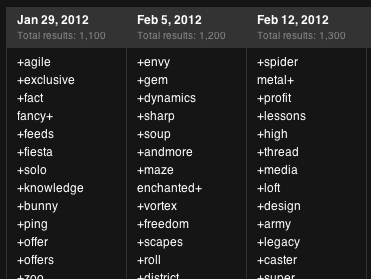 With yesterday’s update, the total number of results returned per search is now 1,400. To see full list of additions over the last month, check out Lean Domain Search’s News page. I’ll continue adding 100 new results each week until the quality of the results or speed of the searches deteriorates. On Monday, January 16, I launched Lean Domain Search, a new domain search tool, on HackerNews. You can see the sharp spike right after the launch thanks to the traffic surge from the initial launch on HackerNews and a second spike midway through thanks to my Two Weeks After HackerNews Launch follow-up post. 66% of the traffic was from referral links: those two HackerNews posts, a FeeFighters blog post about finding a domain name for your startup, social media, a few misc blog posts, and a few mentions on marketing forums. 29% of the traffic was direct traffic which indicates that a lot people are hearing about Lean Domain Search from word of mouth. Right now search traffic makes up a very small percentage of the overall traffic (almost all of which is for searches of “lean domain search” and variations thereof), which makes sense: I don’t have much content on the site and “domain search” is difficult to rank for so I wouldn’t expect a lot of people to find the site via search engines right now. 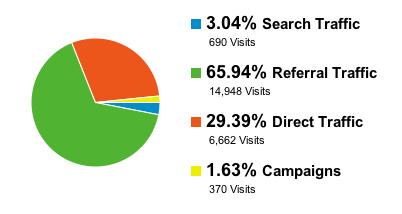 The 370 visits under the “Campaigns” heading are from HackerNews feeds, not from any outbound advertising on my part. The registration dialog box has gone through several iterations over the past month. The change from version 1 to version 2 was intended to offer more registration options and since all the logos wouldn’t fit well, I went with a list instead. 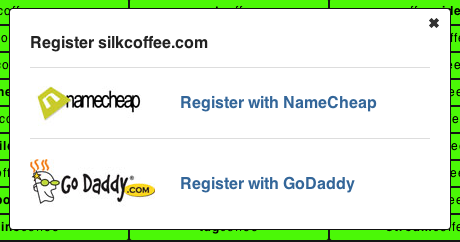 The change from version 2 to version 3 is to improve the call to action button with GoDaddy being the default (like it or not, GoDaddy is still by far the most popular registrar). One frequent request has been to include the availability of the unmodified search query in the results. Most searches won’t have an available .com domain, but you still probably want to know for sure just in case it is. Every Sunday I’ve been adding 100 new prefixes/suffixes to the search results. When the site launched in January, your search would return 1,000 results. With yesterday’s release, you’ll now get 1,300. I’ve been running an A/B test to test the impact of including spacers in the search results. The test was inconclusive (the results were too close to be statistically significant), but I think the spacers make the results a lot more readable so I’ve implemented it for all users. Traffic figures — aka vanity metrics — make nice headlines but they can often paint a misleading picture about how a site is doing. Happily, some of Lean Domain Search’s key metrics are also steadily improving, indicating that these changes are helping. My big project for the next few weeks is adding internationalization support to Lean Domain Search. Down the road, international visitors will be able to choose which language they want the site and the results to be in. First up is Hindi. I’ve already started working with a translator on oDesk and expect to have it fully implemented within a month or so. After that, I’m leaning towards Spanish, but if any of your have a strong preference for your native language (and translations can use the English alphabet), please drop me a note: matt@leandomainsearch.com. All in all it’s coming along very well and I’m excited to see what the future holds. If you haven’t checked it out yet, check out LeanDomainSearch.com and then follow me on Twitter at @mhmazur for updates. While browsing 2+2 today, I came across an excellent post by Greg Tiller, a long time contributor to the Heads Up Sit-and-Go forum who was just getting started around the time I stopped playing 4-5 years ago. Greg plays professionally now and his post is titled Playing Poker for a Living: It’s a Marathon, Not a Sprint. It’s a great post that’s filled with lots of actionable advice for both poker players and startup founders. Startup founders, when you’re reading it simply replace poker with startup and player with founder and you’ll find the advice no less-valid. Two Plus Two is where my poker career began. The lessons I learned here have been the foundation of my success. Through my pursuit of a successful poker career, I hit numerous bumps in the road and learned countless lessons from it. This post is the culmination of my infinite trials and errors (lots and lots of errors). I hope some of you will take my advice and make some changes in your approach to the game. I wish you all the best. A special thanks to: PrimordialAA, ChicagoRy, Mersenneary, Skates, Spamz0r, rumnchess, cwar, and many others that I’m forgetting to mention. A couple of posters immediately chimed in with the traditional “+1”, which got me thinking: it’s interesting how the majority of people seriously involved in the game would agree with parts of that quote. It’s probably a very true observation for most of them. And why wouldn’t it be? How can playing what is essentially a video game, full time, have different consequences? What I will try to convey here is that it doesn’t have to be this way. Accepting this as a basic reality of the game is a fundamental mistake. You can’t socialize via the internet, roll in and out of bed to glue yourself to multiple computer screens day after day, not care about diet or exercise, and expect to be rolling around in money five years from now. It’s unrealistic, and what’s more, it’s the reason why so few grinders enjoy long-term success. I have a very clear picture of this today – because I used to feel exactly the same way. When I dropped out of school to focus on poker, I found myself losing touch with a lot of my non-poker friends, most of whom didn’t understand or agree with my choices.My free time was almost systematically invested in grinding, thinking about grinding, working on strategy, etc. In just a few short years, poker had gone from a hobby to an all-consuming way of life. As a general rule, once people achieve a certain level of success and start making serious money, they often fail to identify that this is despite their stressful, sedentary, unhealthy lifestyle, not because of it. Things could actually be better, but they can’t see that because they are making more money than ever before. But if they constantly chase the next dollar, as if their life were a never-ending session, they risk waking up one day and realizing that the passion they once had for the game has gone completely. And how do you go from making 100k a year while sitting in your underwear, back into the real world? Make no mistake: the average player is getting more and more competent. As for you, if you reach a point where you think you’ve “made it”, and you stagnate, or even regress, because of your bad habits, inevitably the game catches up with you. Suddenly the success you were enjoying only a few months back becomes a distant memory, and you are dealing with atrocious breakeven stretches, dropping down levels, wondering where it all went wrong. Quite a few regulars who not so long ago were able to get lobbies at the 300s/500s, are hardly even able to sit the 110s anymore. These players had majestic Sharkscope graphs, sometimes well into six figure profits, but nothing to show for it. They are absolutely irrelevant in the current context. They float around, unable to make a comeback but not strong enough to quit. How sad is that? Success doesn’t magically last forever. Don’t waste your talent! So… how do you avoid these pitfalls? How do you stay motivated, keep the drive to become a better player? About a year and a half ago, I got to the point where I found myself making very decent money from my play, but somehow feeling unhappy, or incomplete. I was no longer Greg Tiller, who happens to play poker. I was Greg Tiller, the poker player – 24 hours a day, 7 days a week. I was 26 at the time, and asked myself: is this a realistic long-term lifestyle? Could I be in a serious relationship or raise a family living like this? Could I be more balanced? I decided I wanted poker to be a part of my life, but not to take over my life. That I needed to be able to separate myself from the game whilst still pushing myself as a player, becoming more efficient within the fewer hours I spent at the tables. I started doing a million little things to tweak and improve my routine. Tracking what I was doing daily in a journal, trying to identify trends that lead to success or failure. In this long trial-and-error process, some of my ideas worked, and most of them didn’t. In the end, I came to the conclusion that one of the things that attracts a lot of players to the “poker way of life” – the lack of schedule and absence of daily responsibilities – is a big part of what can pull them into the wrong mentality. So I decided to take this into my own hands. I called on mental coach Jared Tendler for help, which turned out to be one of the best investments I’ve ever made. The most important thing I learned from him was the concept of “mental muscle”. I prefer this analogy: If you go to the gym to lift some weights, you would normally tend to warm up in order to loosen yourself up, before going through your workout and pushing yourself really hard. This actually breaks down your muscles initially (which is why you are so exhausted by the end of it). You don’t go back to the gym the very next day and simply repeat the process. You give yourself a day or two for your muscles to recover, to get stronger. And when you go through your routine the second time, it actually seems easier. That’s exactly how Jared wanted me to picture the mental muscle. Something that needs to be warmed up before it’s pushed hard, and which needs to recuperate afterward . You can’t just go at it with everything you’ve got every single day, just like you can’t go to the gym and bench press every day without hurting yourself physically. You don’t see players who grind day in, day out, for five or six years and who are still successful – it just doesn’t happen. If you want your career to last for more than a year or two, you need a plan. I decided to break down a schedule for my week, working around the times where I thought the action was best. Remember, a month is a long time. Setting a monthly goal is important, but you also need to have even shorter-term, less results-oriented goals. Here’s a peek at my weekly routine. I consider it the organization of a mental athlete, designed to help me keep my edge over the competition. My off-day. On Mondays, I stay away from my computer completely and recover from the previous week.. I do something different, and barely think about poker at all. It doesn’t have to be meditating or composing haiku, going out with friends and just having fun is perfectly acceptable; in fact, it’s recommended! My first day back on the grind. That’s when I take care of coaching-related tasks, emails, study/watch videos, etc. Having set a volume goal for the week, say 250 games, I’ll put in about 10 to 15% of that volume on Tuesday. It’s my warm up day, so typically, I’ll one-table and consciously focus on my decision-making. After all, you can’t expect to take one or two days off and be comfortable firing up three tables at your highest stakes the minute you sit down at your desk. You want to loosen up your mental muscle, so you can push hard the days after. I’m still not hitting full gear, and take some time for more studying and coaching. Of course I know that not everyone reading this article is a coach, or even a professional player. For them, this time could be used to get life stuff out of the way, papers and phone calls that kind of thing, so that the next few days can be just about poker. I try to do 15 to 20% of my volume on Wednesday, two-tabling. These are my heavy volume days. My goal is to play from 20 to 25% of my weekly volume on each of those days. The fun thing about this schedule is that if you hit your highest allotted volume goal every day, you will be done by Saturday, and then you’ll get your Sunday free: a nice, healthy, short-term incentive. But most importantly, it’s flexible : if at any point you’re finding it difficult to play your A game over long stretches and are taking too many breaks, you can just try to get as close as possible to the minimum allotted daily volume. It’ll leave you with 15 to 20% of your weekly volume to play out on Sunday. This setup makes me more predictable. My girlfriend likes it because there are days when she knows I’ll be less busy. I can go out for dinner with my family and plan it two weeks in advance, whereas in the past I’d have always been asking myself: “What if the games were really good?”. Naturally, I do not recommend blindly adopting this routine; it’s tailored specifically to my personal needs and my speciality as a poker player, HUSNGs. However, I strongly believe that any poker player can and should find a variation of it that suits him. It’s simply one of the most +EV decisions you can make. The basic ideas of how to approach the game should remain the same. You warm up, you push yourself hard, you recover. Rinse, and repeat. The structure you establish and the time you put aside for non-poker activities encourage you to be social, to be active, and avoid burnout. You know your off-days are just as important as the times you grind, because in order to come back stronger, you need your mental muscle to recover. Finally, the short-term, non-monetary goals you give yourself allow you to detach your emotions from how good or bad you’re running. The actual breakdown of the days varies a lot. When I was still allowed to play on Pokerstars, some days went by quickly – in maybe four to four and half hours – because I was getting constant action. Even when I finished early though, I wouldn’t really push myself past the 25 percent limit. If the action is so good during the week that I’m way ahead of pace and reach my goals early – then more often than not, I just cut it short. Deciding to play an extra hundred games can be tempting, but remember, your volume goal is the estimation of what you’re capable of handling while still playing well. How many hours you play consecutively varies from player to player. Personally, I can handle three-and-a-half to four hours and focus on a high level, but that’s my limit. After that, I’ll take a break, come back and put in another two hours. It’s pretty rare that I can go back-to-back four hour sessions. Although I want to push myself, I’m constantly thinking about this as a long term thing: if I overextend this week, I’ll survive, but it’s going to take it’s toll somewhere down the road. Attempting things like doubling your volume over the course of a month or string seven hour sessions together is not “sucking it up and grinding”. It’s suicidal. You simply do not have the mental muscle. And that’s the root of the problem, it’s the reason why there are so few long-term success stories in poker: too many grinders break down their mental muscle, instead of building it up gradually. Consistency is key: playing poker for a living is a marathon, not a sprint. It’s natural to try to achieve success as fast as you can. But not enough people are happy to pace themselves, to have consistent results week after week. Not financial results (a week is too short of a unit to measure your success by a dollar amount; i.e a few hundred games), but by setting realistic goals and accomplishing them. Work your way up gradually, and be realistic about improvement.Odds are you’re not the next livb112. Don’t try to compare yourself to other people. Compare yourself to what the best version of yourself can be, and try to get there. I don’t want it to seem like I have a perfectly laid out, highly specific poker plan set up for the next five years. I’m open-minded about whatever comes up. Poker players (those who survive at least) need to be adaptive. As Black Friday painfully illustrated, the poker environment is constantly changing, sometimes at a drastic pace – and I’m ready to change with it. Five months ago for example I’d almost never touched a hyper turbo. Since then, I’ve worked hard, read almost everything relevant on the topic, watched all mersenneary’s videos. Now a sizeable part of my volume is at the $250 hypers (the highest limit on the Merge Network). The great thing about the schedule I’ve outlined is that anyone can try it out straight away, and get postive results very quickly. I started organizing my weeks like this two months before the Austin camp. Initially, my students were somewhat reluctant to dive into something similar, because it felt “too much like a job”. By the end of the month though, everyone there, including PrimordialAA, had adopted some aspect of it that fit into their lives. It almost boggles my mind that there is so much training material out there yet barely anyone touches on this, when in my opinion we are dealing with the biggest leak of the average player, one that guarantees that they don’t get the best out of themselves. The average reg is improving, but these bad habits remain extremely widespread. No matter how good the average player becomes strategically, the vast majority will still succumb to this black hole of a lifestyle. Don’t let that happen to you. You can read the full post and comments over at 2+2. 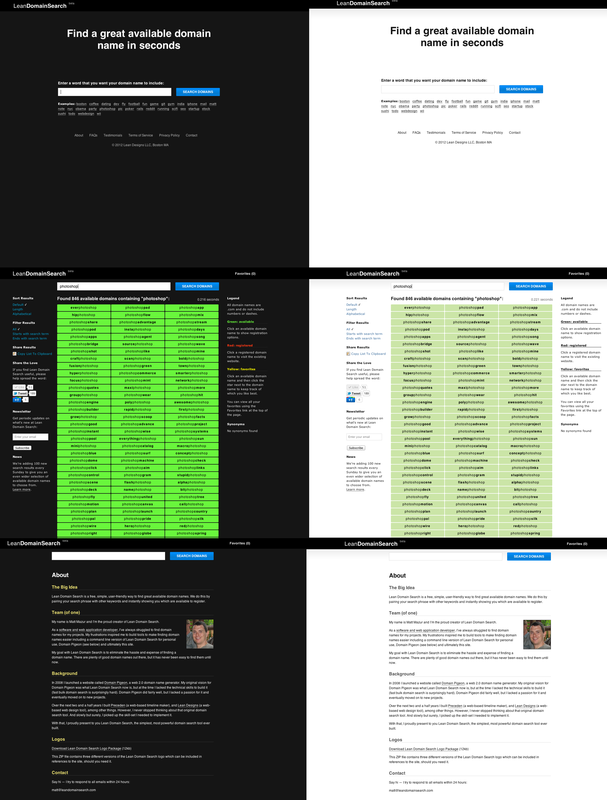 Lean Domain Search, the new domain name search engine I recently launched on HackerNews, has received extremely positive reviews, but one complaint that pops up fairly frequently is the color scheme. The green on black is very harsh to my eyes. Have you considered alternate color schemes? I agree with the sentiment of the green on black. It does look harsh and 90’s stylish web 1.0. I would suggest doing A/B testing on some color schemas. I decided to follow his advice and run an A/B test with different color schemes and see what affect it had, if any, on Lean Domain Search users. Before getting into the technical details, I’ll show you what the final versions of the site looked like. I’ve done a bit of A/B testing of headlines and call to action buttons using Google Website Optimizer, but I’ve never A/B tested an entire color scheme across multiple pages. If that’s possible with Google Website Optimizer, I don’t know how to do it. Fortunately, there’s a much better solution for Rails developers: Patrick McKenzie’s A/Bingo. Because of the way CSS works, any colors that are specified in new_color_scheme.css would take precedence over those in your default stylesheet. Note that A/Bingo does support a true/false syntax, but using yes/no works better because you can add a test_new_color_scheme=yes parameter to a URL in development so that you can preview the new stylesheet and you can’t currently do that using A/Bingo’s true/false syntax. In Lean Domain Search’s case, I wanted to measure the impact on the number of searches a user performed. If the color scheme really was obnoxious, there should be a measurable difference in the number of searches performed. For example, maybe switching to a lighter design encourages people who would otherwise leave because of the harsh design stay longer because they don’t mind the light design as much. Measuring the average number of searches per user would have been an ideal metric, but with traditional A/B testing you have to identify a single event as your conversion. As such, I chose to measure the percentage of visitors that made 4 or more searches. So which design resulted in a larger percentage of conversions? Well, neither. In other words, 167 out of 1006 visitors who saw the dark design performed 4 or more searches and 160 out of 1002 who saw the light did the same. The result is, as A/Bingo notes, statistically insignificant. The difference was insignificant so by the what-percent-of-people-perform-for-four-or-more-searches metric, it wouldn’t matter which design I chose. Despite a few folks not liking it, I’ve gotten a lot of feedback that people do like it too. Almost as as importantly, I like it. The more I like the product I am building, the more likely I am to continue building it. Everyone has a light site. Light is boring. Dark gives the site character (like I said, very subjective). What if the color scheme doesn’t make a difference on how many people make four searches, but it has a big difference on the percentage of people who make it to ten or twenty searches? Maybe the bright green’s effect is significant, but it takes longer for the difference to materialize. What if the color scheme affects the percentage of people who buy a domain through Lean Domain Search? Maybe the bright green excites people more on average and they are more likely to buy. What is the color scheme affects how long people spend on the search results page? Maybe people spend a significantly longer time on the page with the light background. What would that mean? What if people are more likely to share Lean Domain Search because the dark color scheme makes it stand out? What if the affect of introducing a site-wide design change for existing users (half of which open the site and have it gone from black to white) frustrates those users and makes them less likely to come back to the site? What if measuring the number of searches is a poor metric? What if people make more searches because they haven’t found a domain name that they like? I say this to make it clear that you should take this result — and any result — with a grain of salt. There are often second and third order effects of your changes and you need to think through them to make sure you didn’t miss something important. As Daniel Tenner notes, data is dangerous. If you enjoyed this post, you should follow me on Twitter: @mhmazur. 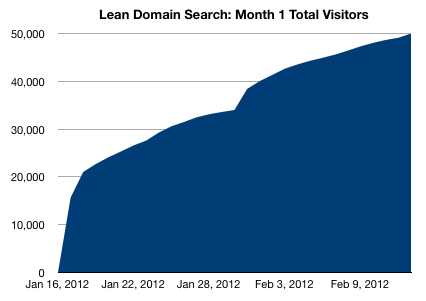 And check out Lean Domain Search, the best damn domain search engine ever.